I work with a couple of modules witch are only different by its svn versions (trunc, branches etc.). Depending on my work I add or remove single modules from the project. Not sure about exact implementation details of use-case you described, just want to comment on 'A workaround is to remove all breakpoints from the module witch I have removed, but it's hard going' - IDEA offers convenient way to manage break points via dedicated 'Breakpoints' control that is activated via 'Ctrl+Shift+F8' hotkey. 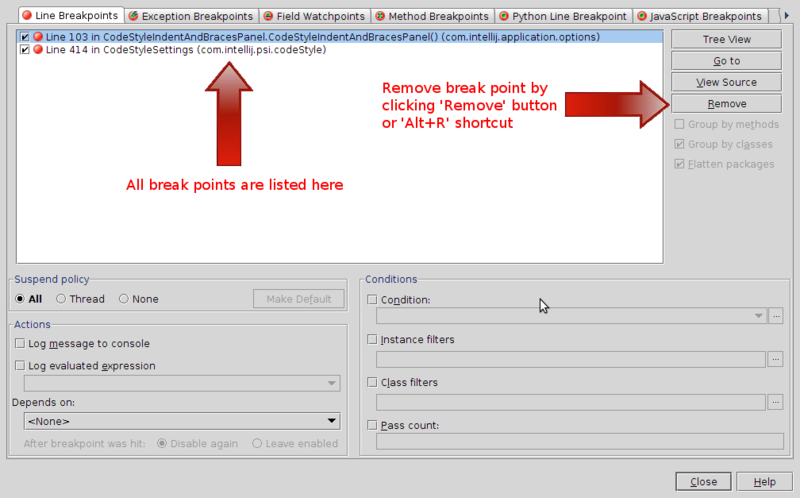 It represents all existing break points and allows to remove any of them by single-click (see attached screenshot). The dialog with all breakpoints listet are well known. In this view I can see my bearkpoints I set up (of all modules). The debugger try to stop in these sources and is finding source files whitch have the same name and package location but this from an other module. The difference of the two modules are minimal, but I have to manage this because I work with trunk an some branches at the same time. Have anybody some hints for me?